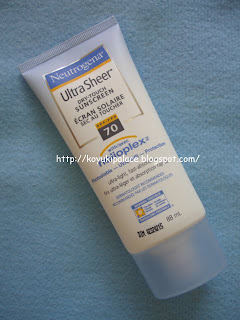 This is one of the best sunscreen I've ever used!! Most sunscreens are creamy, thick and greasy.. after you sweat, it just makes you all sticky and uncomfortable... but this one is soft, dry and not greasy at all! During the summer, sunscreen is necessary everyday! Although I hate using it.. but still.. either you get a tan/sunburnt and a higher risk of getting skin cancer.. or.. you gotta use it!!! I tried it on my hands then put hand cream on, it's still soft and not greasy!! However, when you put it on, you gotta be careful to spread it out evenly!